HDLC (High-level Data Link Control) - Encapsulates the data during transmission and is a link layer protocol which is also the default Cisco encapsulation protocol for synchronous serial links. HDLC is supposed to be an open standard, but Cisco's version is proprietary, meaning it can only function with Cisco routers. HDMI (High-Definition Multimedia Interface) - is an audio/video interface for transmitting uncompressed digital data. It is a digital alternative to previous analog standards, such as coaxial cable (RF), composite video, S-Video, component video, VGA, and others. HDMI connects devices such as Blu-ray players, AVCHD camcorders, computers, video game consoles, stereo receivers, computer monitors, digital TVs, and others. HDMI supports 1080p video, 3D video, and 8 channels of 24-bit 192kHz audio. HDMI also supports High-Bandwidth Digital Content Protection (HDCP) which prevents copyright infringing media from playing at full resolution. HDMI is backward compatible with DVI via the use of an adapter. Hop - An intermediate connection in a string of connections linking two network devices. On the Internet, for example, most data packets need to go through quite a few routers before they reach their final destination. Each time the packet hits another network device, a hop occurs. You can see how many hops it takes to get to another Internet host by using the PATHPING or traceroute utilities. HTML (HyperText Markup Language) - HTML is a basic language used to write web pages. HTML is a markup language and not a full-blown programming language. HTML is parsed by your web browser when a web page downloads and consists of tags (commands) which control the page layout, formatting of text, locations of images, etc. HTTP (HyperText Transfer Protocol) - HTTP is part of the TCP/IP suite of protocols and is responsible for defining the rules of exchange between a web browser and a web server. These rules dictate the exchanging of files (text, graphic images, sound, video, and other multimedia files) on the World Wide Web. HTTPS (HyperText Transfer Protocol Secure) - HTTPS is HTTP over SSL (Secure Sockets Layer) which provides encryption for secure transactions. Developed by Netscape, this protocol is used for internet transactions where encryption of personal and financial information is paramount as in e-commerce. Secure pages will have https:// at the beginning of the URL rather than http://. 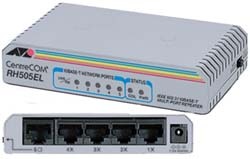 Hub - A physical layer network device used to connect multiple Ethernet devices together. Active hubs act as a repeater and boost the signal in order to allow for it to travel farther, while passive hubs simply pass the signal through. Most hubs have an uplink port that allows them to connect to other hubs, a router, or other network device. Hybrid Topology - Hybrid topologies are a combination of any two or more network topologies in such a way that the resulting network does not resemble any of the original topology types used to create it. Two common examples for Hybrid network are: star ring network and star bus network. A Star ring network consists of two or more star topologies connected using a multistation access unit (MAU) as a centralized hub. A Star Bus network consists of two or more star topologies connected using a bus trunk (the bus trunk serves as the network's backbone). See an example of a hybrid topology below.